Large hail. Damaging winds. Tornadoes. All of those could be possible on Wednesday as severe weather moves through North Texas. Large hail. Damaging winds. Tornadoes. 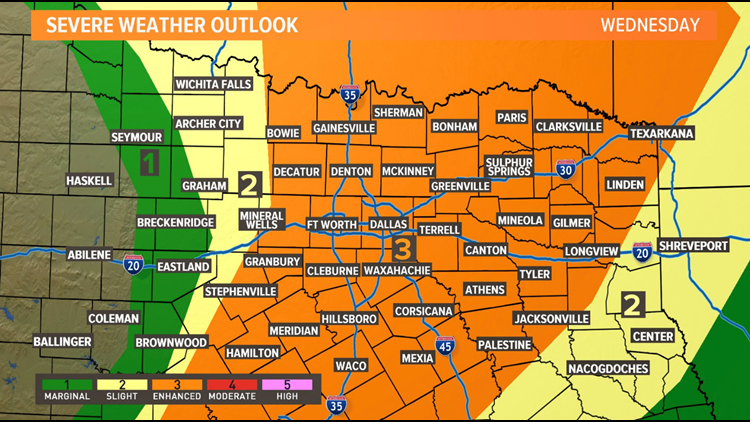 All of those could be possible on Wednesday, as strong storms are expected to develop across North Texas in the afternoon and into the evening. A few light showers may develop through midday, but by mid to late afternoon thunderstorms are expected to develop. Initially, storms will be isolated, but more organized storms are expected this evening into the early overnight hours. Large hail, damaging winds, and a few tornadoes are possible. 7 a.m. to 9 a.m. The morning commute should be fine – cloudy and humid, but mostly dry. A couple showers could pop up further south, toward Cleburne and Hillsboro, but that's about it. 11 a.m. to 3 p.m. Showers could become widespread across North Texas, but we still aren't expected to see the severe stuff in the late morning and early afternoon. You might get wet, but you won't see hail or strong winds. 5 p.m. to 7 p.m. This is when the storms could start to develop in the western parts of North Texas – think Parker County and western Tarrant County – and also in areas like western Denton County and Wise County. 7 p.m. to midnight. This will be our main window for severe weather, as storms will likely become widespread across North Texas. That's everywhere from Johnson County to the south and Collin County to the north, with storms developing and moving west to east. This is also when we could see the damaging winds, the possibility of tornadoes and large hail, up to the size of baseballs. The storms should pass through Dallas County by 11 p.m., moving into Rockwall and Kaufman counties and then into East Texas by midnight. Watch: Greg Fields explains update on severe weather on Wednesday. Watch: When does hail become 'severe'? We could see a slight chance of rain on Thursday, but the severe weather will be cleared out, and it should be mostly dry, setting up for a nice weekend with temperatures in the 70s and 80s. Storms should end early on Thursday with clearing skies into the afternoon. Highs on Thursday will only be near 70° with brisk NW winds of 15-20 mph. Sunny skies and warmer weather for Easter Weekend.